For the last few years, REV’IT! has been trying to get their “American” offering of jackets where the sizing is consistent with most other manufacturers. When they first started selling in the US, they sized their alpha sized jackets so that they fit about one size smaller than anybody else. In the last couple years, they’ve corrected the issue and now their jackets fit as most people might expect. But with the Airforce, unfortunately they have taken a step back and this one fits like the original sizing chart which will be about one size smaller than you might expect. And for most people, that means you’ll have to buy one size larger jacket than you normally wear in men’s clothing. I’d highly recommend you use a tape and measure yourself and then use the chart to choose the correct size. Below is the REV’IT-published chest sizes for each jacket’s alpha size along with our estimate of max waist/belly. We include a waist/belly measurement because if you have some belly, then you will want to make sure you are buying a jacket that is large enough to accommodate you. Those with a waist that is trimmer than the chart indicates for their chest size can use the adjustment straps to customize the fit with no problem. A jacket like this looks great with the waist adjusters in a bit. With this jacket, we see that the jackets don’t taper a lot so the belly issue won’t be a problem for most. Need help measuring? Get it here soon as we’re done. This Airforce jacket by REV’IT reminds me a lot of very similar mesh styles from Alpinestars this year. The jacket is lightweight and a good portion of the shell is mesh material which will allow the wind to blow right through. This set-up is the classic configuration for very hot weather use. The overall styling is sharp I think. I like the contrasting color and the two offerings with some neon and red look good to me. As for other nice features…you get a decent number of pockets… two on the outside and one large inside patch pocket. And the jacket can zip to compatible pants, or it has a loop in the back you can use to simply tie the jacket’s tail down to the belt on your jeans. This is a handy thing to prevent draft from blowing up the tail of the jacket and inflating it at highway speeds. REV’IT! 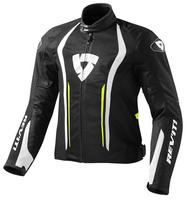 sells an evaporation vest for this jacket which you can take a look at by using the link below. I’ve used evaporation vests before, and they work great with mesh jackets like this. And they work best in very dry weather conditions. In high humidity though, they remain kind of clammy rather than cool and airy, and of course they work best with constant air flow such as on the highway. In town they’ll lose much of their evaporative mojo. FYI: A bit of trivia… I credit Joe Rocket for “inventing” the mesh jacket back around 2002. The very first one was the original Phoenix jacket. Unfortunately the pictures from our site in 2002 didn’t archive.